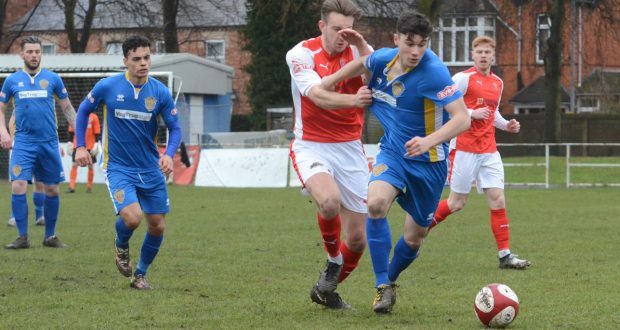 A superb strike by 20-year-old James Hugo was Spalding United’s only reward from a feisty Evo-Stik NPL East Division derby defeat at Lincoln United on Saturday. Hugo’s 50th-minute goal cancelled out the home side’s first-half advantage, which came courtesy of a scrambled effort by former Tulip Tom Garrick two minutes before the interval. But on the day the Tulips were unable to build on the leveller and conceded a second and deciding goal, again from the alert Garrick just past the hour mark. Indeed, Matt Easton’s Tulips were unable to repeat the fluency of their play which had earned rich rewards against high-flying Pontefract Colleries a week earlier. They marginally had the better of the opening half, creating a few promising attacking movements, but the trend was reversed after the break in a game plagued by some, at times, baffling and inconsistent decisions by the referee. Bradley Wells, the hat-trick hero against Pontefract, was within inches of hitting the target after just two minutes. Taking a neat flick-on by Kegan Everington in full strike, he side stepped two defenders before getting his shot away – but the ball rose just inches over keeper Michael Emery’s crossbar. Everington, probably enjoying his best form of the season, was forced out of the action mid-way through with a leg injury and was replaced by Romario Martin. Parity was restored five minutes into the second half, however. A strong attacking movement out of defence saw Hugo race onto a well directed cross-field pass by Martin and unleash a superb left-footed strike from an angle, just outside the home area, to give Emery no chance. The action that followed was hotly contested, but with The Whites enjoying more of the passages of play. Their winning goal, however, was virtually presented on a plate in the 64th minute. A long ball from defence caught out the Tulips’ defence, allowing an offside-looking Garrick to run through and glide the ball past a stranded Smith. Captain Leon Mettam brought a telling save from Emery a few minutes later as the Tulips battled for a share of the points. But Lincoln, who had not won a game in their previous nine outings, were the ones celebrating at the final whistle. The defeat sees Spalding stay 16th in the table, but they are also just three points above basement side Gresley. Tulips: Smith, Floyd, Marshall, Everington (Martin 36), Misambo, Spafford, Brownell (White 88), Cooper, Wells, Mettam, Hugo (Fixter 62). Not used: Humble, Duggan. MOTM (joint award): Spafford and Floyd.